Implantable medical devices have come a long way since doctors installed world's first pacemaker in Arne Larsson's chest in 1958 but they've always been hamstrung by a reliance external power sources. 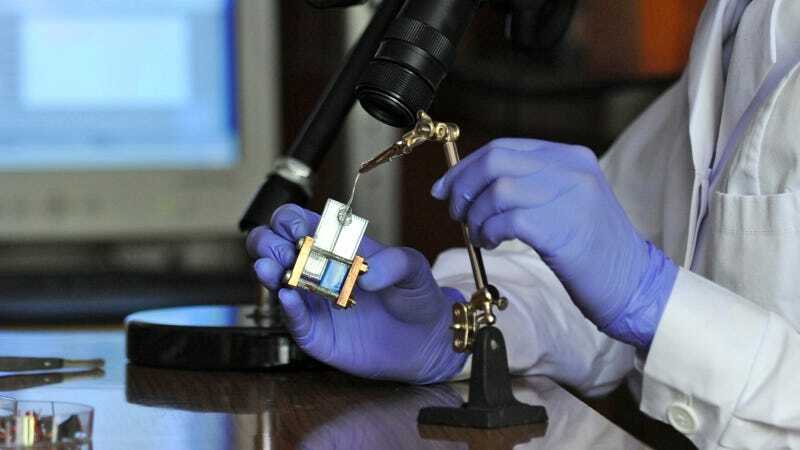 However, a new zinc-air battery chemistry developed by Institute of Physical Chemistry in Poland could eventually provide its host's implants with an unlimited power supply. Let the cyborg revolution begin. "One of the most popular experiments in electrochemistry is to make a battery by sticking appropriately selected electrodes into a potato, explained Dr Jönsson-Niedziółka in a study published in the upcoming issue of Journal of Power Sources. "We are doing something similar, the difference is that [...] we'd rather replace the potato with… a human being." The IPC team's zinc-air battery operates much like other zinc-airs, such as those in hearing aides: the zinc anode oxidizes in atmospheric air, moving electrons across a circuit to the carbon cathode. For this battery, however, the Polish team ditched the conventional carbon cathode with a specially-designed electrode they've dubbed a "biocathode." This is constructed from a core of biological enzyme (bilirubin oxidase) wrapped in carbon nanotubes, coated in silicate gel, and finally wrapped again in an oxygen-permeable membrane. The cathode is implanted in the patient and when paired with a traditional zinc-air fuel cell it can produce 1.75 V for up to 10 days and when multiple cells are connected, they can produce enough juice to (theoretically) power anything from pacemakers to artificial eyes.